Los Angeles (AFP) - Drew Brees achieved a couple more milestones and Tom Brady breathed a sigh of relief in a bruising day of monumental NFL comebacks and dramatic finishes on Sunday. 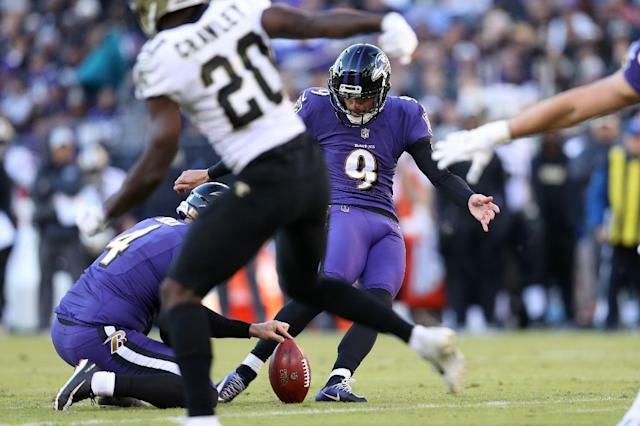 Brees threw his 500th career touchdown as the New Orleans Saints beat Baltimore for the first time in 16 years after Justin Tucker missed his first career extra point kick with 24 seconds remaining. Brees, who etched his name in the record books earlier this month by eclipsing Peyton Manning in all-time passing yardage, threw two touchdowns as the Saints escaped with a 24-23 win over the Ravens. Brees recorded his 500th touchdown pass to join Manning, Brett Favre and Tom Brady as the only quarterbacks to reach the milestone. He also became just the third player in history alongside Manning and Favre to record wins over all 32 NFL teams. "You only get to play these guys once every four years, and not to put the pressure on it, but every time we play these guys, it's been a battle," Brees said. "They've had some pretty great defenses over those years." The win left the Saints sitting on a lofty perch atop the NFC South with five victories and just one loss. Heading into the contest, Brees had lost all four of his previous games against the Ravens. With just 24 seconds left on the clock, the Ravens scored the potential tying touchdown when quarterback Joe Flacco completed a 14-yard pass to receiver John Brown. That set the stage for Tucker to come in and extend his streak of 222 consecutive conversions and potentially send the game into overtime. Tucker's boot missed wide right which sparked a celebration by the Saints, who had marched back from a 10 point deficit to seize the late lead. Heading into the game Tucker was the most accurate kicker in NFL history in terms of field goal percentage. "I thought I hit it well," said Tucker. "At the end of the day I feel like I cost us the game." 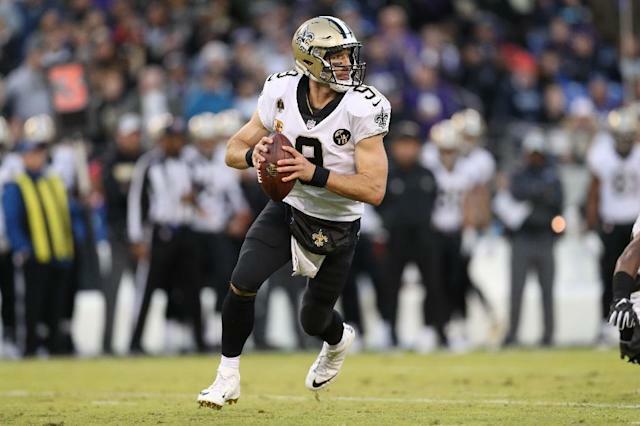 Brees completed 22 of 30 passes for 212 yards as he connected with tight end Benjamin Watson on a short strike into the end zone in the second quarter for the 500th career TD pass. 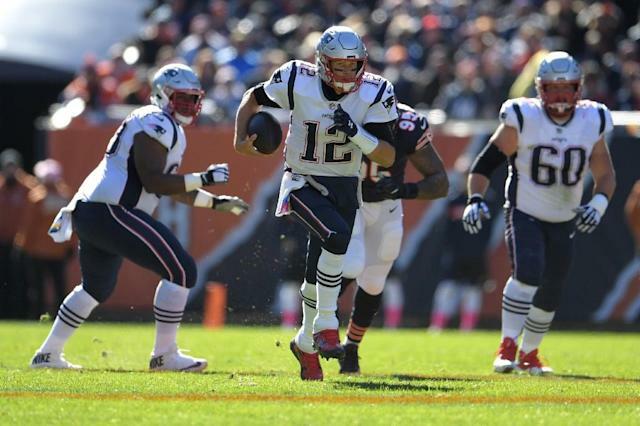 Elsewhere, Brady threw for 277 yards and three touchdowns as the New England Patriots earned their first road win of the season by rallying to defeat of the Chicago Bears 38-31. The game almost turned on Mitchell Trubisky's 54-yard Hail-Mary with no time on the clock but the Bears were stopped just shy of New England's goal line. "It's a game of inches," said Bears receiver Kevin White who hauled in the pass but was pushed back. "He got a good throw on it," said Brady. "You hold your breath. "I saw him jump up and catch it. I am sure it was short by a half yard or a yard. Pretty close." New England had to overcome a 10-point deficit, two dropped interceptions, two fumbles that led to Bears' touchdowns and some ill-timed penalties. "The more we're on the field, the more we can practice, the more we can figure out where everyone fits and what we're doing a good job at," Brady said. "Those will sort themselves out." 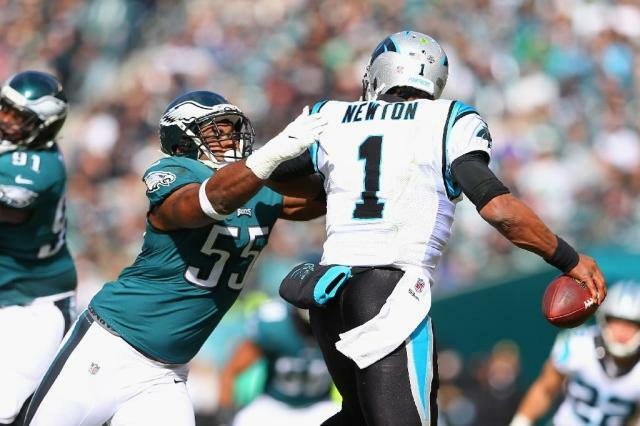 In Philadelphia, Cam Newton tossed a one-yard touchdown pass to Greg Olsen with 82 seconds remaining as the Carolina Panthers stormed back from a 17-point deficit in the fourth to beat the Philadelphia Eagles 21-17. The Panthers improved to 4-2 with their biggest comeback in franchise history, while the defending Super Bowl champion Eagles dropped to 3-4. With the Eagles up 17-0 and appearing to be headed for a victory, the Panthers were motivated after witnessing Philadelphia players dancing and showboating on the field before a kickoff. "We collectively got together and knew that we had to up the tempo and have a sense of urgency," said Panthers Christian McCaffrey. Also, Todd Gurley scored three touchdowns and Jared Goff threw two TD passes as the Los Angeles Rams preserved their status as the lone unbeaten team by clobbering the mistake-prone San Francisco 49ers 39-10. The Rams now have seven consecutive wins to open the season for the first time since 1985. The latest instalment of the Dallas Cowboys-Washington Redskins rivalry didn't disappoint as Washington scored a touchdown off a sack of quarterback Dak Prescott with just under five minutes to go to beat the Cowboys 20-17. Dallas' comeback fell short when kicker Brett Maher's 52-yard field goal attempt with three seconds remaining clanged off the left upright. The Redskins (4-2) won consecutive games for the first time this season and stretched their lead atop the NFC East.